Discussion in 'Star Style' started by SweetFantasy, Jul 28, 2009. 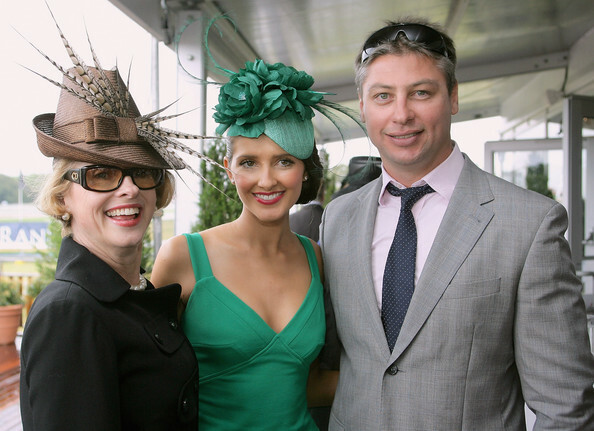 Kate Waterhouse is an Australian socialite, her mother Gai Waterhouse is a successful horse trainer in Melbourne. She is married to a footballer, Luke Ricketson. She reminds me a little of Olivia Palermo because of her polished style. Kate Waterhouse arrives for the Cartier LOVE Day 2009 at the Cartier Store on June 17, 2009 in Sydney, Australia. Media personality Kate Waterhouse attends the launch for the Gucci Spring Summer 2008 Collection on March 19, 2008 in Sydney, Australia. You got it spot on with the comparison to Olivia Palermo. I had actually heard of Kate before Olivia, and instantly thought they were alike. Thanks for those pictures mrsjamesdean! Stylesightings - in the (in)famous Balmain blazer. Racing identity Kate Waterhouse and former rugby player Luke Ricketson arrive at the David Jones Autumn/Winter Collection launch show at Town Hall on February 13, 2007 in Sydney, Australia. The event showcases Australia's best designers and is based on a 'Streets Of Dublin' theme. Kate Waterhouse and Luke Ricketson arrive for Vogue Australia's 50th Anniversary Party at Fox Studios on July 31, 2009 in Sydney, Australia. Kate Waterhouse and Luke Ricketson arrives for the official launch of the David Jones American Express Credit Card in Darlinghurst on September 30, 2009 in Sydney, Australia. ^ aw they are very cute! i like her style, i think she's somewhat driven by trends but she manages to look polished and classic most of the time. I love what she wears to the races every year, she nails it, i've never seen her look bad at the races. and, fun fact, she went to the same school as me, she was really sweet. i feel that if anyone had her money, they'd put together the same looks. they are pretty much the trends/brands/items that all mainstream media latches onto, trying to be edgy (ie balmain jacket, ripped jeans, leather skirt/jacket)..
kate has said on a few occasions that other actresses/media personalities should go for a more daring, different style instead of playing it safe when going to different events, but it doesn't seem as if she's made any avant garde fashion choices herself . i agree with peachescream in that she's trend-driven! however she does always look nice. I find this dress blooming gorgeous in its simplicity. Does anyone know who it's by? I quite like her - but her style is nothing special, very generic and trendy (it reminds me of Lara Bingle's "style" actually).